Heat oven to 325F. 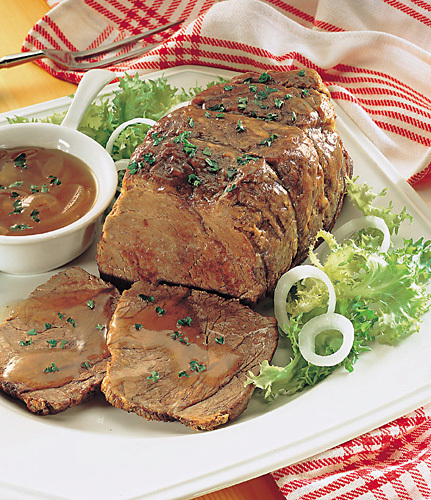 Lightly coat beef pot roast with flour. Heat oil in Dutch oven over medium heat until hot. Brown pot roast; remove. Add 1-1/2 cups water and vinegar to Dutch oven; cook and stir until brown bits attached to pan are dissolved. Return pot roast. Add onions, shallots, dates, salt and pepper; bring to a boil. Cover tightly and cook in 325F oven 2 to 2-1/2 hours or until pot roast is fork-tender. Remove pot roast; keep warm. Cook liquid and vegetables over medium-high heat to desired consistency. Carve pot roast. Serve with sauce. Recipe and photo appears courtesy of Cattlemen's Beef Promotion Board.